If you follow my blog, you’ll know of my weakness for hellebores. You may even remember that Ashwood Nurseries of Kingswinford is one of my favourite places in the gardening world. I’ve already teased you with a few pictures from my last trip, but I’ve much more to share. OK, Ashwood Nurseries and its highly acclaimed owner, John Massey may not be exactly secret, but my view is that if all keen gardeners don’t know about this nursery, they’re missing a trick. If you ever have just half a chance to visit, and you like unique plants, especially shade-loving ones, promise me you’ll go – you’ll not be disappointed. But don’t expect a heavily branded experience. This nursery does things its own way. I was lured down again by the chance to tour the breeding facilities where their hellebores are developed. Ashwood Nurseries produce strains – top notch ones. They are renowned as speciality breeders yet very few of the hundreds of thousands of plants they produce are named. It never takes much arm twisting to get me there. I love exploring their neatly tended display gardens, plant areas and greenhouses dedicated to their specialities: not just hellebores but also cyclamen, hepatica, lewisia, primula, salvia and anemone pavonina. 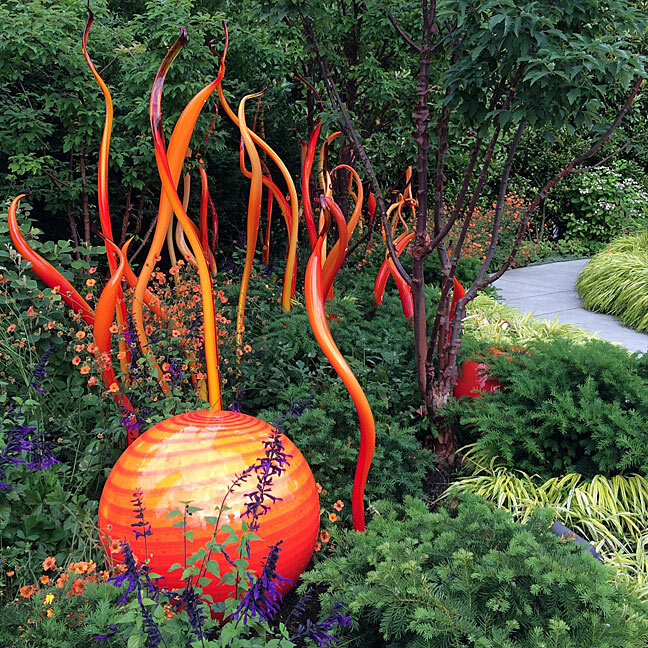 The plants displayed are always at the top of their game and glimpses behind the scenes show equal care. 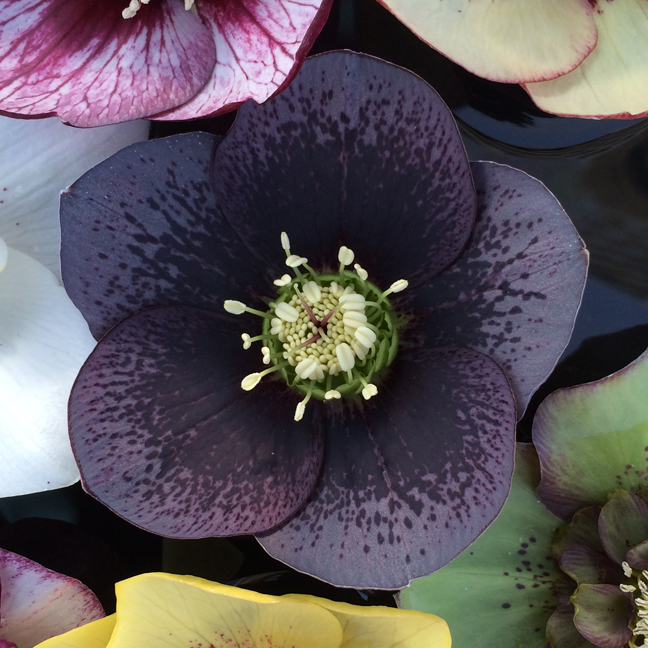 Are hellebore strains better than named hybrids? In the past many hellebore hybrids were named then propagated for sale by division. Graham Rice and Elizabeth Strangman appear to say that the well-known old clones ‘Ariel’, ‘Miranda’, ‘Neptune’ and ‘Oberon came from the same parentage as ‘Pluto’ – and even the same seed capsule. How times have changed! 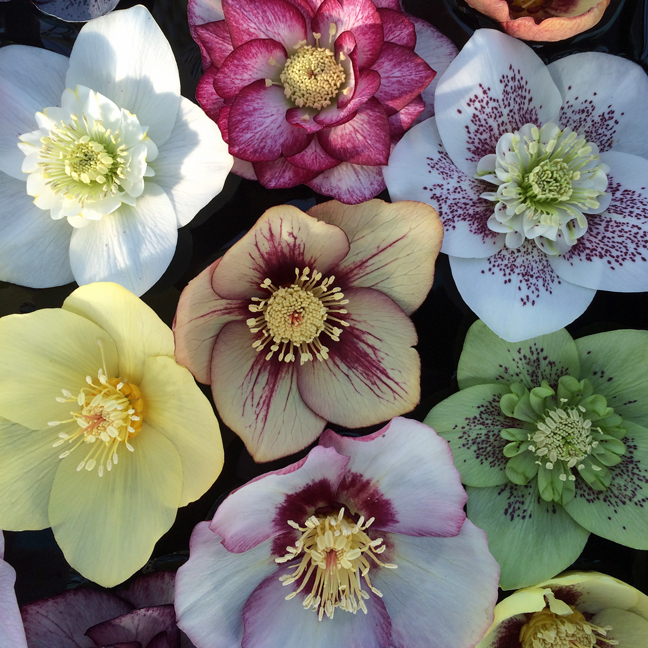 Today breeders are much more reluctant to name hellebore hybrids, for good reasons. It’s extremely expensive to protect a large number of named cultivars just in Europe, let alone worldwide: ridiculously so if you factor in the need to litigate when you spot any license abuses. We’re paying our share of these legal bills as consumers when we buy named plants. And we’re not even getting the latest varieties: it can take years to build up sufficient stocks of cloned plants. Most named cultivars have a sell-by date: they are quickly superseded by better plants. This is particularly true of hellebores, where breeders are now making rapid advances. Ashwood Nursery side-step this minefield by marketing their latest crop of plants under the general name of Helleborus x hybridus Ashwood Garden Hybrids, split into various colour groups. We travelled from Shrewsbury through some beautiful countryside and several classic English towns and villages: the West Midlands’ answer to The Cotswolds. Vic Aspland, Cyclamen Society President and friend of the nursery, was our guide. Vic explained the process and the outlined the characteristics that Ashwood’s hybridisers, Kevin Belcher and Jill Pearce, are working towards. I’m sure he kept a few secrets back, but I always find this part fascinating. You might think that every breeder is looking for essentially the same thing – novelty, but that’s not the case. Each team of breeders I’ve met is looking to push nature in a different direction. Non-fading strains that don’t go back to green (they’re having great success with peaches and apricots). It’s a three year programme. Members of the breeding team pot on 8,000 to 10,000 seedlings for assessment each year. Hellebores first flower about two and a half years after germination, unlike roses, which just take a few weeks. Seedlings are carefully assessed and any plants that move the process on are kept for breeding. The rest are sold as garden hybrids. Purists might suggest that it’s better not to divide clumps: I can see their point. 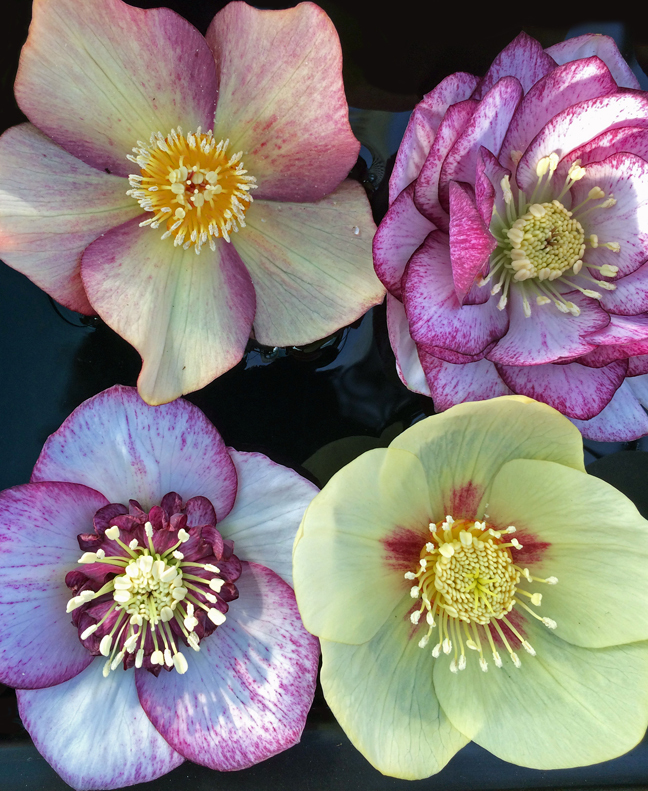 Hellebores are slow to recover and a fine, well-established plant has great beauty. Patient gardeners lucky enough to have a larger, woodland garden might enjoy growing plants from the best quality seed they can source. Just as the flower opens, remove the anthers to prevent self-pollination. Dust the stigma with pollen from the other parent plant, then bag it. If you want to be scientific or repeat the cross if it works well, gently label each cross and use a different paintbrush for each type of pollen. Pollinate both ways, giving both parents chance to form seeds – many plants only produce good crosses one way. Never store seed dry, as this inhibits germination. Ashwood Nurseries sow fresh hellebore seeds in July, thickly, as this seems to improve germination rates. The seeds germinate as temperatures fall in September. It’s always a problem for plant breeders when everything happens at once. Unfortunately for Kevin and Jill, Ashwood garden hybrids germinate rapidly soon after the first ones appear ‘like mustard and cress’. Prick seedlings out and grow them on in 1 litre pots, repotting next year into 3 litre pots. The stems of hellebore seedlings are very easy to bruise: any damage most likely means the end of the plant. Loosen the soil, take hold by the leaf not the stem, and very gently firm in. 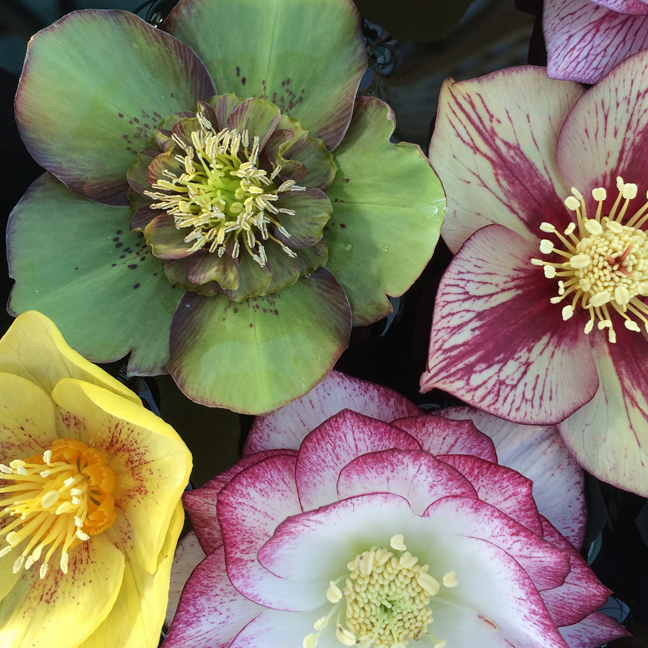 One of the exciting parts of the tour, if you’re planning to purchase plants, is the chance to visit their greenhouses and to choose from a much wider selection of hellebores for sale than you’ll usually find on display. Needless to say, I couldn’t resist. It’s like seeing all the little faces at The Battersea Dogs’ Home: I want them all! I snapped up a couple of well-established plants just released from the breeding programme. 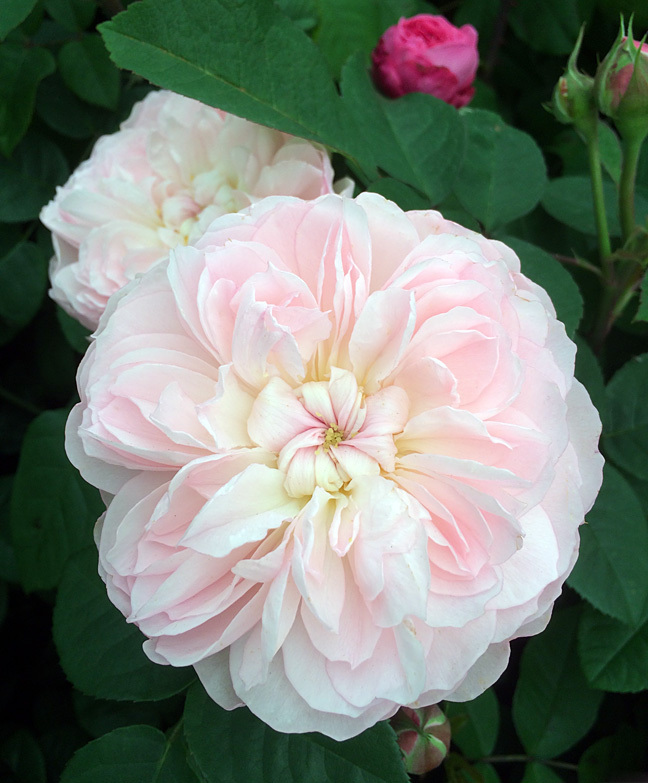 My heart was quickly stolen by a pretty double: its flesh coloured inner petals have a teardrop shaped spotting effect and dark purple reverses. I knew I couldn’t leave that one behind without regretting it later. I selected a primrose yellow single with lovely, rounded petals as its companion. The pure colour was lifted by a deep burgundy staining around dark nectaries that reminded me of the iris of an eye. But as my new purchases are being retired from stud and put out to pasture (I’m not planning to breed them, though I’m sure seedlings will appear), I came home with them primarily because they are such outstanding garden plants. They’re very floriferous, with 50-60 flowers on each plant. We all have different tastes and I could see other gardeners finding their perfect hellebore companions all around me. That’s one of the benefits of visiting Ashwood Garden and Nursery to choose a hybrid yourself, rather than buying a mass-produced, named cultivar. Plants for rebels and rule breakers? I’ve not met the Ashwood Nurseries team so I can’t speak for them. l take it for granted that plant breeders are obsessive: I don’t know if it’s a coincidence that hellebores attract so many intellectuals, rebels, explorers and rule breakers. I’ve met several of their passionate supporters over the years, and visited Barry Glick’s mountainside nursery by snow plough as well as Will McLewin’s Stockport one, much closer to home. I’ve long observed that these characterful plants attract controversy in other ways too. Vic amused me by saying that any time he ventures to give advice in a talk on hellebore cultivation about what should not be done, there’s always someone at the back of the room waving their hand with glint of glee in their eyes, claiming they have great success doing just that! It seems these winter flowering mountain plants are easier to please than we might imagine. Just give them well-drained, humus rich soil with an open texture that holds moisture in summer, but never gets waterlogged. In England, though they’re usually associated with the partial, dappled shade you’d find in a woodland glade, they’ll do fine in full sun with a little cover from companion plants. Cut hellebore stems back after flowering if you want to prevent your plants from self-seeding all over the garden. This is another subject where you’ll hear apparently conflicting advice. Vic says if the leaves are looking tired, he cuts them off at the start of December. This helps avoid moulds and disease and shows the flowers off to their full advantage. Some suggest cutting the leaves from garden hybrids when the buds start to appear – taking care to avoid snipping off the flower buds too. Others leave the plants to their own devices as in the wild, and don’t cut the leaves at all. As so often with hellebores, almost anything goes! I’ve read that the best type of species hellebore for cutting is the green-flowered argutifolius. My botanist father would never have countenanced cutting wild flowers – and even if they’re grown in gardens or commercially, it seems a shame to cut their caulescent stems for floristry. Perhaps others think like me: I’ve rarely seen them used. 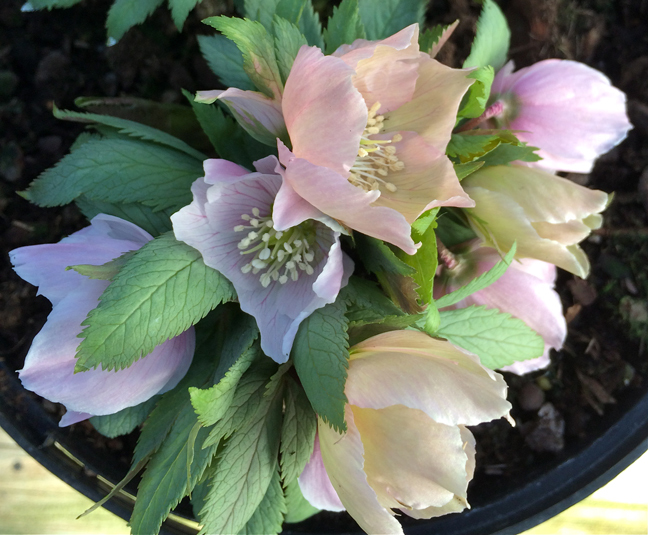 More often you’ll spot Christmas roses (Helleborus niger) or hellebore hybrids with single flowers held on long, sturdy stems combined with other garden flowers to create winter or spring bridal bouquets and floral arrangements. 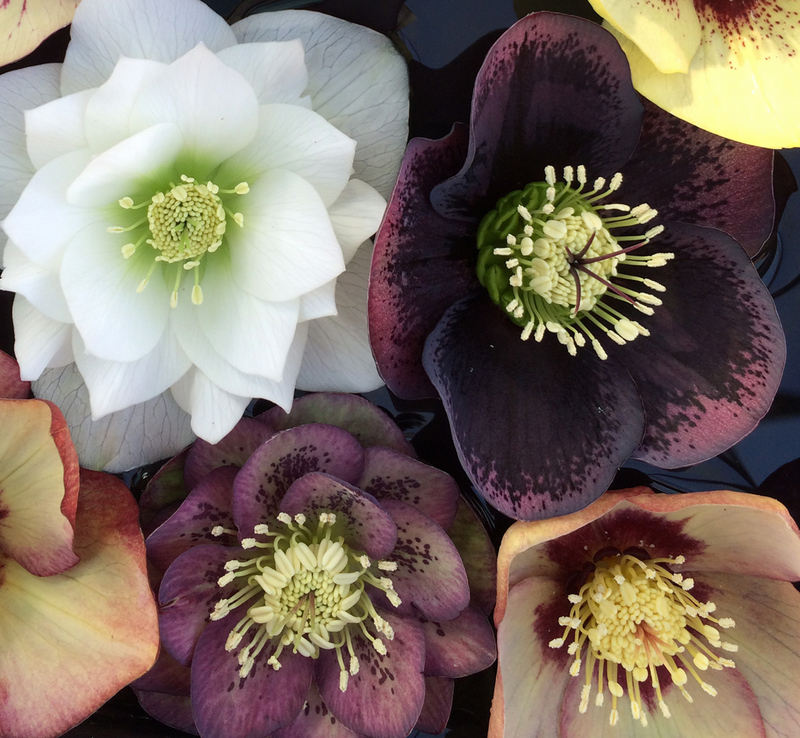 Why do so many people lose their hearts to hellebores? Perhaps it’s the way these flowers hang so demurely, their varying, but always subtle colours, or the way we have to lift each flower up to appreciate its individual beauty in a floral treasure hunt. Their nodding flower heads serve a practical purpose too, protecting them from rain like so many tiny umbrellas. 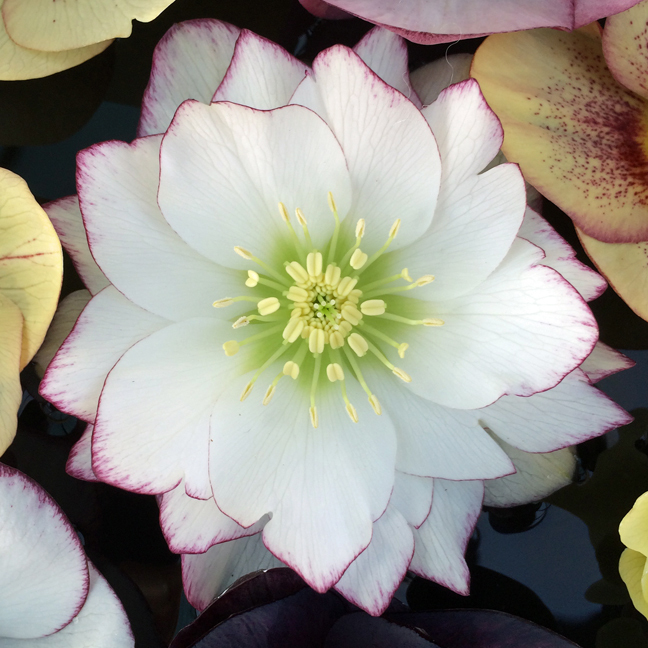 Hellebore flowers are technically made up of sepals not petals – they’re modified leaves. This explains why green flowers are the norm and their ability to last for so long. Coloured hybrids evolved to attract insects but often revert to green as they gradually fade and form striking seed pods. I’ve grown hellebores from seed, stalking the winter garden with as much patience as I can muster, what seems like years afterwards, waiting for the first buds open. I’ve seen their flowers hanging frozen and sorrowful looking in winter, the plants themselves under a blanket of snow, and marveled at how quickly they perk up as the weather improves. Some plants, like snowdrops, seem sent to give us hope that Spring is on its way: hellebores make the time until Spring arrives so much better. I have lots of pictures from the hellebore day and can’t think of the best way to display them. For now, they’re just scattered through my text. If you have comments or any other ideas, please feel free to let me know. So many pretty flowers but the flower in the 2nd pic with the deep eggplant-purple shade really caught my eye. its just exquisite. Wow! I didn’t know helleborus, and know I want some. They are sooo beautiful. I’m not shure if I can get them in my Country, but now I want to find out. The photos are impressive. Have a great day! You’re more likely to find pink or green ones. Good luck! Amazing variation. I would love to buy some sees for the black and green varieties. What a treat to discover an entirely new type (to me) flower. I’m glad you found your way here. Really dark black ones are quite unusual – seeds from a black variety can easily end up being a different colour. 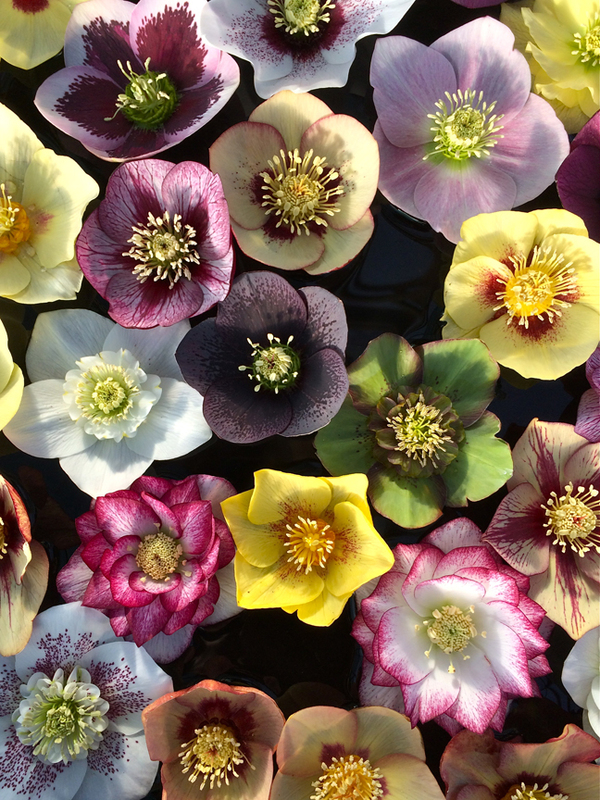 The great thing about growing hellebores from seed is that each one is different but – if you like them at all – you’ll rarely see one that isn’t beautiful. I haven’t been able to find any seed for the black that fades from light to dark black with “freckles” though.. or the lovely green one. There are thousands of varieties, aren’t there? To be fair, I only looked at one seed source a friend sent me a link to. She also loves plants.. but she’s in the states. Don’t know how easy it is to get seeds into Mexico, where I live. I know you can’t bring them in in luggage. I’ll enjoy them online, though. Wish I lived nearer this nursery. Your photographs are beautiful and the text is so interesting. These flowers are so beautiful!!! 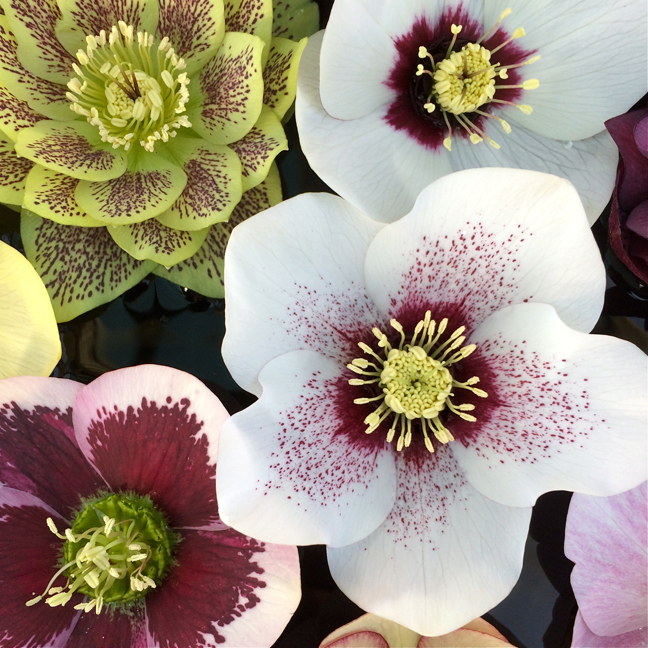 Hellebores are some of my favourite flowers. Amazing, you just added a place to visit on my bucket list. I hope you soon get to cross it off! It’s nice at any time of the year but well worth checking online for any special days and events they have coming up, especially if you’ll be travelling quite a way to visit.